With the emergence of information describing functional selectivity and biased agonists and antagonists has come a lack of confidence in “one size fits all” assays for detection of agonism. Seven-transmembrane receptors are pleiotropic with respect to the signaling protein to which they couple in a cell, and many conformations of the receptor can be formed; this leads to systems where ligands can stabilize unique conformations that go on to selectively activate signaling pathways. Thus, such “biased” ligands can produce cell-specific agonism that may require targeted assays to detect and quantify. It also predicts that ligands can have many different efficacies for the many behaviors that the receptor can exhibit (referred to as “pluridimensional efficacy”), leading to a breakdown in the common classifications of agonist and antagonist. This all poses unique challenges to the pharmacologic nomenclature of drugs, the detection and optimization of new drugs, and the association of phenotypic clinical profiles with pharmacological properties of drugs. Drugs are characterized by three molecular properties: affinity and efficacy for a biological target and target coverage (the kinetics of target occupancy in an open in vivo system). These properties are unique for drug-receptor pairs, thus they can be used to characterize drug activity for a given receptor in a cell type-independent manner. This makes scales of affinity and (relative) efficacy useful because they can be estimated in a test system and used to predict activity in all systems, including the therapeutic one. Over the past 20 years, there have been reports that there are certain molecules, notably dopamine (Lawler et al., 1994; Mailman et al., 1998; Mottola et al., 2002) and serotonin (Berg et al., 1998) receptor agonists, that do not follow a simple scheme of a single cell system-independent efficacy for agonist-receptor pairs (Roth and Chuang, 1987; Fisher et al., 1993; Heldman et al., 1996). These agonists have been identified as being “functionally selective” or “biased” toward certain response pathways over others compared with other agonists. It is useful to consider this growing drug class in terms of emerging views of efficacy and models of receptor function as contrasted with the original definition of pharmacological efficacy. When R. P. Stephenson introduced the concept of efficacy, it referred to the property of a molecule that caused a cellular system to change its state; specifically he was quantifying the contraction of guinea pig ileum to alkyltrimethylammonium compounds acting on muscarinic receptors (Stephenson, 1956). The sensitivity of the cell and the power of the agonist determined the overall amount of contraction obtained, so in essence the cell was a rheostat set at a given volume control. The tacit assumption was that efficacy was linear and agonists produce a uniform quality of activation to the receptor. Under these circumstances, if the cell is sensitive enough, all of the physiological functions mediated by the receptor will be observed. This assumption was the product of a limited window into cellular function, i.e., all Stephenson had to denote efficacy was a single readout of response, namely longitudinal smooth muscle contraction. A single efficacy allows the use of equiactive potency ratios for receptor and drug classification, because these cancel cellular effects and yield a measure of related agonist activity that depends only on affinity and efficacy. Because these are unique properties of the agonist and receptor (irrespective of cell type), they could be used to characterize relative agonism in one system for prediction of effect in any other system (including the therapeutic one). This provided a powerful tool to pharmacology, because the effects of cellular coupling and receptor density could be cancelled through the use of the null method, i.e., it is assumed that the cell will process equal levels of response to any agonist in the same manner. This concept has proven itself highly valuable in drug discovery but, as noted above, a growing list of reports in the literature indicate that exceptions to this rule have been found. It is worth considering the reasons for these divergences. Before recombinant cellular systems could be constructed, in vitro functional pharmacology relied on animal isolated tissues. Although a number of tissue systems have been used over the years, the bulk of pharmacology aimed at receptor and new chemical entity classification was done with a limited number of reliable and serviceable tissues (i.e., guinea pig ileum, rat atria, rabbit aortae, etc.). This being the case, the majority of pharmacological estimates of affinity and efficacy were made in a limited number of systems, and the resulting data seemed fairly homogenous. With the advent of recombinant technology, human cDNA can now be transfected into nearly any cell line to obtain a functionally sensitive assay; this greatly expanded range of cellular background results in the observation of cell-based variation in agonist effect more pronounced than that seen in animal isolated tissues. It should be noted that some variances seen with these systems have been ascribed to “nonphysiologically relevant” overexpression of receptors in cellular hosts, thus it is difficult to separate this possibility from actual physiologically relevant cell-based variation in agonist efficacy. It has since been recognized that recombinant systems can yield agonist-receptor profiles that differ considerably from those found in natural systems, necessitating the prerequisite testing of agonists in natural cell lines as a prelude to progression to the clinic. Furthermore, it also has been noted that receptors in diseased systems can yield altered signaling, suggesting conclusions about agonist therapeutic utility may also need to involve testing in model disease systems. 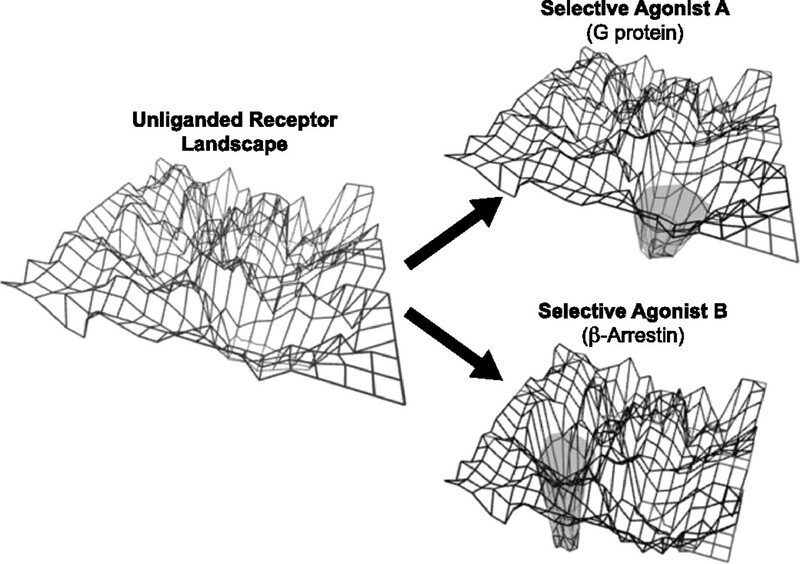 The availability of recombinant systems opened the door to observing cell-based heterogeneity, but the most significant advance to the definition of agonist efficacy was the ability to observe multiple agonist-induced receptor behaviors. This allows the independent observation of the activation of multiple G proteins, β-arrestin, and other effects such as receptor phosphorylation and internalization (see Fig. 1). Before this advance, all receptor behaviors were inferred from observable tissue behaviors, usually cellular response or second-messenger production. Thus receptor desensitization and internalization necessarily were linked to the disappearance of response. With the ability to observe receptor behaviors independently, striking divergences such as the active internalization of receptors by antagonists in the absence of cellular activation (Roth and Chuang, 1987) were unveiled. This showed that efficacy for many agonists is not linear (i.e., some agonists do not facilitate all behaviors of receptors) but rather is collateral (Kenakin, 2005), whereby only a subset of receptor behaviors are activated. In addition, multiple monitoring of receptor behavior unveiled efficacy as being “pluridimensional” (Galandrin and Bouvier, 2006); there are many possible receptor-based efficacies, and ligands can have varying subsets of efficacies. It is useful to discuss the impact of pluridimensional efficacy on receptor pharmacology and drug discovery; as a preface, the consideration of possible molecular mechanisms that could be responsible for these effects lays the foundation for the discussion. Agonist receptor binding can lead to activation of G proteins (C) and subsequent phosphorylation of the receptor by GRKs (A). The receptor is an allosteric protein accommodating many proteins (referred to as “guest” proteins in an allosteric system; Kenakin and Miller, 2010) that cobind with the agonist. They also can bind multiple extracellular molecules such as allosteric modulators (B), which can, in turn, modify the behavior of the receptor toward cytosolic guest proteins. The protein β-arrestin migrates to and binds to the receptor upon activation (D), which can lead to receptor internalization (E) into endosomes. 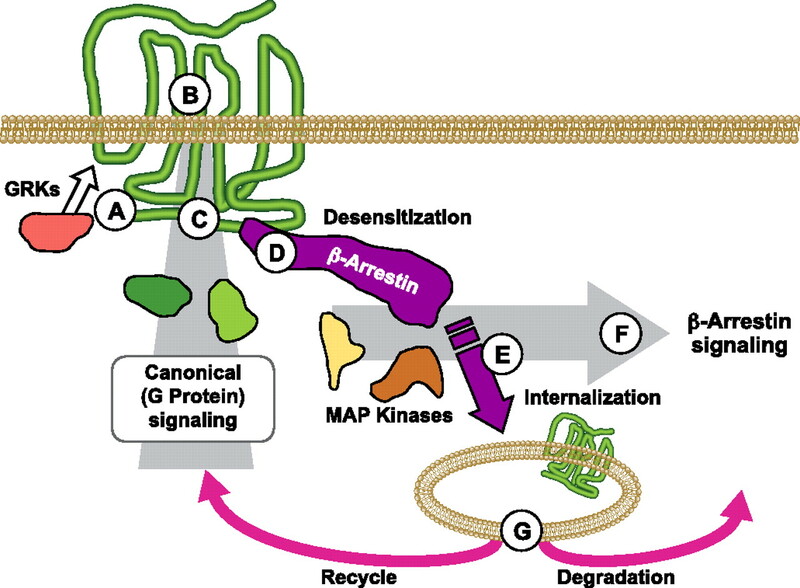 Internalized receptor/β-arrestin complexes can form a scaffold for mitogen-activated protein (MAP) kinases to produce signalsomes emanating long-lasting cell signaling in the cytosol (F). Internalized receptor can recycle to the cell surface or be degraded (G). A working model of efficacy is given by Burgen's description of “conformational selection” (Burgen, 1981). In this scheme, receptors are thought to adopt several (at least two) conformations one of which is the “active” state that binds to cellular signaling proteins and promotes response and another that does not. Thus proteins, such as receptors, can be seen to traverse an “energy landscape” whereby thermal energy drives the protein into preferred energy wells (see Fig. 2) (Fraunfelder et al., 1991; Hilser et al., 2006). Functionality is linked to these conformations as some of those preferred (seen as wells in the landscape) are associated with preferential affinity for cellular signaling proteins (Onaran and Costa, 1997; Onaran et al., 2002). When a molecule binds to the receptor it becomes another thermodynamic species and the ligand-bound receptor then traverses a new energy landscape (Peleg et al., 2001) (see Fig. 2). By virtue of a selective affinity for an active-state conformation, agonists preferentially bind to this species. Because the receptor conformations are interconvertible, this selective binding produces a thermodynamic pressure toward enrichment of the active species at the expense of the inactive species, i.e., according to Le Chatelier's principle, “If a dynamic equilibrium is disturbed by changing the conditions, the position of the equilibrium moves to counteract the change.” This links the agonist with specific signaling through the receptor, i.e., a ligand enriches a particular conformation that produces a signal. The most simple system is one where there are only two receptor conformations, but this has now been shown to be untenable. Molecular dynamic modeling of proteins predicts that numerous receptor conformations exist in accordance with the thermal energy in the system and proteins exist in “ensembles” of multiple conformations (Onaran and Costa, 1997; Onaran et al., 2002). Under these circumstances, ligand binding alters the thermodynamics of receptor ensemble formation, i.e., agonists cause the receptor to traverse new energy landscapes (see Fig. 2) and thus take on new functional behaviors. The multiple conformations produced by receptors can be seen as the protein rolling on an energy landscape with preferred conformations existing as energy wells. In an allosteric system such as that produced by agonist activation of a seven-transmembrane receptor (and subsequent binding to a cytosolic signaling protein), the binding of the agonist thermodynamically produces a different energy landscape for the receptor to traverse. Different functionally selective agonists may produce different landscapes and these dictate the subsequent cellular behavior of the receptor toward signaling molecules. Shown are two selective agonists; agonist A preferentially produces biased coupling to a G protein, whereas agonist B biases coupling to β-arrestin. A variety of experimental techniques have shown that different ligands can stabilize different receptor conformations (for review see Kenakin and Miller, 2010), thereby dispelling notions of the enrichment of a single active receptor state for agonism. Thus a mechanism is described for agonist functional selectivity in the form of the stabilization of ligand-specific receptor conformations that then go on to selectively interact with different cellular coupling proteins to induce collateral activation of cellular pathways (Kenakin, 2005). Thus, different conformations will not produce identical changes in multiple areas of the receptor protein and will not produce homogeneous effects on subsequent activation of multiple cellular signaling proteins, i.e., agonist-specific receptor conformations can produce biased cell signaling. It now remains to be considered how selective activation of cellular signaling pathways could lead to cell-type variable efficacy. It would be predicted that different cells contain the machinery required for their optimal function and survival and that this machinery would not be constant for every cell type. Therefore, cellular differences in agonism would be expressed through links of receptor conformation to the signaling proteins that interact with the activated receptor. For example, one possible link are G protein-coupled receptor kinases (GRKs) through a mechanism whereby the receptor conformation controls trafficking of signaling through patterns of phosphorylation. Thus, receptor conformations are in essence “barcoded” by GRKs and then go on to differentially interact with G protein and/or β-arrestin pathways (Zidar et al., 2009). Levels of GRKs and β-arrestin are known to vary with cell type (Lohse, 1993; Ménard et al., 1997; Tobin et al., 2008) as does G protein availability (Philip et al., 2007). If an agonist-bound receptor was exposed to these various environments in different cells (with subsequent variability in signaling capability) it could be seen how differential activation of pathways could result (Violin et al., 2006). In fact, such cell-type variation in agonist activity has been observed with label-free assay technology (Peters and Scott, 2009; Schröder et al., 2010). There are now numerous reviews describing functionally selectivity; the phenomenon has been observed and verified in many receptor systems (Kenakin, 2003; Perez and Karnick, 2005; Leach et al., 2007; Mailman, 2007; Kenakin and Miller, 2010). What is not clear is the therapeutic relevance of the effect. Before discussion of this important ramification, it is useful to discuss the impact of functional selectivity on pharmacology and drug discovery in general. The ability of ligands to stabilize different receptor conformations affects the application of pharmacological techniques to the process of new drug discovery. First, the concept of efficacy becomes complex because ligands can have multiple efficacies that translate into multiple observed activities. These activities may manifest themselves in different ways in various organ systems, leading to a breakdown of the simple behavioral classifications of full agonist, partial agonist, antagonist, and inverse agonist. Although the receptor density and efficiency of receptor coupling in different tissues was a well known determinant of full versus partial agonism, and the presence or absence of constitutive activity was known to allow the differentiation between inverse agonist and neutral antagonists, delineations between agonist and antagonist remained fairly uniform when “efficacy” was measured as simple second-messenger production and/or tissue response. However, with the ability to measure multiple receptor-mediated cellular response pathways, these simple associations are no longer valid. For example, the observation that β-blockers such as propranolol and carvedilol can be inverse agonists for Gαs-mediated cAMP formation but positive agonists for extracellular receptor kinase (ERK) activation (Azzi et al., 2003) and the observation that antagonists devoid of tissue response-mediating efficacy still actively internalize receptors (Roth and Chuang, 1987) show how some ligands can be agonists for some pathways and antagonists for others. These types of dichotomies are leading to confusion in drug nomenclature and classification (for further discussion of this issue see Kenakin, 2008). However, they also allow for a finer association of pharmacologic activities with clinical phenotypes. For example, there are a number of theoretical reasons that β-blockers might be beneficial in congestive heart failure, yet clinical trials of 16 β-blockers yield data to show that only three, and primarily carvedilol, are of clinical value in this disease (Metra et al., 2004; Wisler et al., 2007). This suggests that it is the other properties of carvedilol, in addition to β-blockade, that distinguish this molecule in the clinical setting, further suggesting that knowledge of a full range of pluridimensional efficacies for a given molecule can be useful in directing new molecules toward the clinical testing process. This also furnishes texture within the possible chemical targets of new drug discovery programs. Thus, the choice of a chemical target for a given program could be refined to include a combination of efficacies and/or a selective activation of a subset of cellular signaling pathways. These ideas suggest ways in which the drug discovery process may be modified to accommodate functionally selective ligands. There are two arenas of drug discovery and development that are affected by collateral efficacy and functional selectivity: ligand detection (screening) and lead optimization. It is worth considering these separately. For screening, the assay needs to be all encompassing (in terms of detecting effect), sensitive, and as simple to decode as possible. Conventional second-messenger screens (i.e., cAMP, inositol triphosphate, calcium) fulfill the third criterion (simple to decode) but may fall short of detecting all possible efficacies present in a molecule. In contrast, assays detecting more comprehensive and amplified “downstream” signals (i.e., ERK; Crouch and Osmond, 2008) or label-free assays (Fang et al., 2006; Peters and Scott, 2009) fulfill the first and second criteria but then may require additional mechanistic studies to determine mode of action. There may be special conditions that favor one type of assay over another. For example, if the second messenger can confidently be linked to therapeutic effect (i.e., insulin release and glucagon-like peptide-1 receptor agonism via elevation of cAMP; Kim and Egan, 2008) or if therapeutically relevant primary cells can be used in a label-free assay screen, then these factors would need to be considered. Functional selectivity can pose a daunting challenge to drug discovery from the point of view of the screening and development of new molecules. In a linear efficacy environment, a “one size fits all” functional assay such as calcium transient detection through fluorescent signaling could be relied on to detect all agonists, providing that the cell line used for the screening is of sufficient sensitivity to detect low-efficacy ligands. In a functionally selective world, this may not be the case if the assay does not respond to activation of a therapeutically relevant pathway used by a biased agonist. For example, imaging assays have been shown to detect compounds otherwise not detected with binding or flurometric imaging plate reading assays (Ross et al., 2008). This would be predicted to be a problem only for so-called “perfectly” biased ligands that seem to solely activate one pathway to the exclusion of others [such as the angiotensin agonist SII ([sarcosine1,Ile4,Ile8]Ang II), which seems to activate only β-arrestin; Wei et al., 2003]. Parenthetically, it should be noted that the designation of “perfect” bias is difficult to defend because it usually is associated with functional systems of insufficient sensitivity to detect activation of one of the pathways involved. This, of course, does not necessarily suggest that a more sensitive system would not detect the second pathway activation apparently totally insensitive to the apparent perfectly biased ligand, i.e., perfection may disappear in a more sensitive tissue system. Therefore, it probably would be more prudent to designate these ligands as having extreme bias. Currently there are few such examples of extreme bias. Most known biased molecules affect multiple pathways but emphasize some over others. This being the case, a robust high-throughput screen that detects the interaction of a molecule with a receptor might be expected to detect most biased and unbiased ligands. However, the next step, namely lead optimization, may require further testing to identify selective signaling and optimize the therapeutic relevant aspects of the effect. Functional selectivity poses the unique question in the lead optimization process, namely, are the therapeutically relevant efficacies of a given molecule being optimized? There are a number of potential sources of information that can assist in answering this question. First, there may be theoretical physiological data available to suggest that selective activation of a defined signaling pathway will produce therapeutic superiority. For instance, it would be predicted that opioid agonists that did not induce receptor internalization (interaction of the receptor with β-arrestin with subsequent internalization) would furnish better chronic analgesia than agonists that desensitize through this mechanism (Varga et al., 2004; Groer et al., 2007). Likewise, stimulation of β-arrestin via angiotensin receptors with no concomitant stimulation of G protein leads to blockade of Gq activation by angiotensin II and a separate β-arrestin-mediated antiapoptitic effect. This combination of activities could be of value in the treatment of congestive heart failure (Violin and Lefkowitz, 2007). Useful data can be obtained from knockout animals as well. For instance, it has been reported that beneficial analgesic effects with morphine are enhanced and prolonged in β-arrestin-2 knockout mice, thereby confirming the link between desensitization and β-arrestin-induced receptor internalization (Raehal et al., 2005). Likewise, in mice devoid of β-arrestin 2, parathyroid hormone (PTH) does not stimulate bone formation or increase the number of osteoclast cells, thereby suggesting that β-arrestin plays an important role in PTH in building bone (Ferrari et al., 2005). This further indicates that a biased β-arrestin PTH agonist would be beneficial in the treatment of osteoporosis (Gesty-Palmer et al., 2009). In β-arrestin null mice, nicotinic acid acting on the nicotinic acid receptor GPR109A (HM74A) produces beneficial effects in lowering serum-free fatty acid levels with reduced flushing (from that seen in normal mice), indicating that an agonist of GPR109 devoid of effects on β-arrestin (biased toward Gi protein activation) could be a superior treatment for dyslipidemia (Walters et al., 2009). It may not be known a priori which signaling pathway is the therapeutically relevant one. In these cases the sorting of molecules into different biased collections could allow the testing of these in therapeutically oriented animal models to determine whether bias offers a therapeutic advantage. Figure 3 shows a scheme for compound progression considering possible functional selectivity. If highly selective assays are available to compare signaling pathway activation, then lead optimization of ligand bias theoretically would be possible. A quantitative scale with which medicinal chemists could optimize such bias is provided by application of the Black/Leff operational model in the form of a transducer coefficient that embodies the affinity (KA−1) and efficacy (τ) of an agonist for a given tissue response [specifically, ΔLog(τ/KA) values; Kenakin, 2009; Kenakin and Miller, 2010]. 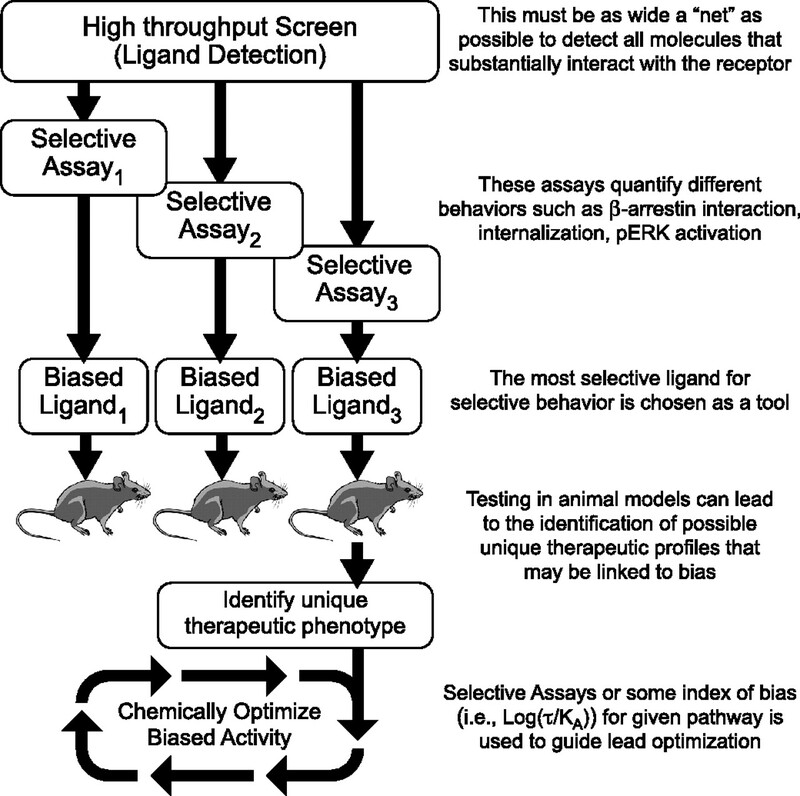 Scheme to detect molecular bias and associate it with a phenotype in a therapeutic animal model for optimization of unique activity. If a sufficiently broad screening assay is used (collecting a wide range of molecules that associate with the receptor target), then a battery of assays to detect a range of efficacies (i.e., G protein signaling and second-messenger production, β-arrestin association, phosphorylation of ERK1/2, receptor internalization) could be used to compare the relative activity of the hit molecules in each assay. Quantification of the power of the molecules to activate various pathways [for example through the use of Log(τ/KA) values from fitting dose-response curves to the Black/Leff operational model (Kenakin and Miller, 2010) or the application of relative activity values (Ehlert, 2005; Tran et al.,2009)] could then be used to identify exemplar biased molecules to be tested in animal models to detect possible superior therapeutic profiles. It is difficult to assess the prevalence of bias in agonist ligands because it seems to be a relatively new phenomenon, the first mechanistic model describing it being published 15 years ago (Kenakin, 1995). However, the observation of the phenomenon paralleled the advancing technology that allows observation of the multiple behaviors of receptors and as this capability increased, so, too, has the observation of biased signaling. From a theoretical point of view, if ligands exercise efficacy through stabilization of ensembles of receptor conformations, then it would be unlikely that any two ligands would produce identical ensembles of conformations. Under these circumstances, it would be equally unlikely that different ensembles would activate multiple guest signaling proteins in the cell in an identical manner, thus it would be predicted that almost all synthetic ligands would show varying degrees of bias toward signaling proteins. The basis for this effect is the varying recognition of multiple protein conformations (in this case the receptor) by a given ligand; this is the driving force for production of unique ensembles. A parallel situation is the recognition of varying receptor states by antagonists to yield either partial or inverse agonism. Although inverse agonism seemed to be a relatively rare phenomenon when first observed, subsequent observation of antagonist effect in constitutive systems over the years revealed that neutral antagonism is the rare condition and that inverse agonism is, as theoretically predicted, a much more common phenomenon (Kenakin, 2004). It will be interesting to determine whether experimentally observed biased agonism falls in line with the theoretical prediction. Although it is well established that ligands can be biased (both agonists and antagonists), it is not yet clear to what extent this effect can be exploited for therapeutic advantage. Ultimately, as more functionally selective molecules enter the clinic, translational medicine will enable association of pharmacological functional selectivity with therapeutic advantage. An excellent example of the translational study of a known biased ligand in vivo is given by the testing of TRV120027, (Sar-Arg-Val-Tyr-Ile-His-Pro-D-Ala-OH) a β-arrestin-biased angiotensin type II receptor ligand with kinase pathway-activating properties (Violin et al., 2010). This ligand reduces mean arterial blood pressure in rats (such as angiotensin antagonists) but, unlike standard antagonists, does not decrease, but rather increases cardiac performance (Violin et al., 2010). Such studies will facilitate the evaluation of biased signaling in therapeutics. Table 1 shows a list of some of the therapeutic areas and some of the purported ligand-biased effects that may hold advantages over current conventional therapy. It also would be worthwhile to retrospectively analyze known molecules already in the clinic for possible bias to associate pre-existing, but as yet unknown, cases of where functional selectivity yields a unique profile of activity in humans (e.g., carvedilol in congestive heart failure). A great deal of data obtained over the past 15 years suggests that the original pharmacological ideas of efficacy are simplistic for so-called pluridimensional agonists and ligands that produce biased signaling. This has practical ramifications for the classification of new chemical entities, the approaches to new drug discovery, and the interpretation of clinical phenotypic response. Insofar as new assays can shed light on these new effects, the result could be a finer definition of drug selectivity designed at the bench using translational data from the clinic. I thank numerous colleagues for discussion of functional selectivity, notably Richard Mailman, Christian Watson, Bryan Roth, Louis Luttrel, Robert Lefkowitz, Arthur Christopoulos, Bill Clarke, and Marc Caron. Their perspective has considerably widened my narrow perspective on the problem. (2009) Molecular determinants of angiotensin II type 1 receptor functional selectivity. J Mol Cell Cardiol 46:15–24. (2003) β-Arrestin-mediated activation of MAPK by inverse agonists reveals distinct active conformations for G protein-coupled receptors. Proc Natl Acad Sci USA 100:11406–11411. (1999) Enhanced morphine analgesia in mice lacking β-arrestin 2. Science 286:2495–2498. (2007) Versatility of GPCR recognition by drugs: from biological implications to therapeutic relevance. Trends Pharmacol Sci 28:438–446. (1981) Conformational changes and drug action. Fed Proc 40:2723–2728. (2008) New strategies in drug discovery for GPCRs: high throughput detection of cellular ERK phosphorylation. Comb Chem High Throughput Screen 11:344–356. (2006) Resonant waveguide grating biosensors for living cell sensing. Biophys J 91:1925–1940. (2005) Bone response to intermittent parathyroid hormone is altered in mice bull for β arrestin 2. Endocrinology 146:1854–1862. (1993) Selective signaling via unique M1 muscarinic agonists. Ann NY Acad Sci 695:300–303. (2004) H1-receptor stimulation induces hyperalgesia through activation of the phospholipase C-PKC pathway. Neuropharmacology 47:295–303. (2009) A β-arrestin-biased agonist of the parathyroid hormone receptor (PTHR1) promotes bone formation independent of G protein activation. Sci Transl Med 1:1ra1. (2003) Aripiprazole. Nat Rev Drug Discov 2:427–428. (2007) An opioid agonist that does not induce micro-opioid receptor-arrestin interactions or receptor internalization. Mol Pharmacol 71:549–557. (1996) Pharmacological basis for functional selectivity of partial muscarinic receptor agonists. Eur J Pharmacol 297:283–291. (2006) A statistical thermodynamic model of the protein ensembles. Chem Rev 106:1545–1558. (2006) Disruption of PTEN coupling with 5-HT2C receptors suppresses behavioral responses induced by drugs of abuse. Nat Med 12:324–329. (2004) Efficacy as a vector: the relative prevalence and paucity of inverse agonism. Mol Pharmacol 65:2–11. (2003) Ligand-selective receptor conformations revisited: the promise and the problem. Trends Pharmacol Sci 24: 346–354. (1995) Agonist-receptor efficacy II: agonist trafficking of receptor signals. Trends Pharmacol Sci 16: 232–238. (2008) Pharmacological onomastics: what's in a name? Br J Pharmacol 153:432–438. (2009) 7TM receptor allostery: putting numbers to shapeshifting proteins. Trends Pharmacol Sci 30:460–469. (2008) The role of incretins in glucose homeostasis and diabetes treatment. Pharmacol Rev 60:470–512. (1993) Molecular mechanisms of membrane receptor desensitization. Biochim Biophys Acta 1179:171–188. (2005) Expression of V1A and GRP receptors leads to cellular transformation and increased sensitivity to substance-P analogue-induced growth inhibition. Br J Cancer 92:522–531. (1998) Functional effects of novel dopamine ligands: Dihydrexidine and Parkinson's disease as a first step, in Dopamine Receptor Subtypes: From Basic Science to Clinical Application (Jenner P, Demirdamar R eds), IOS Press, Fairfax, VA.
(1997) Synergistic regulation of β2-adrenergic receptor sequestration: intracellular complement of β-adrenergic receptor kinase and β-arrestin determine kinetics of internalization. Mol Pharmacol 51:800–808. (2004) Beta-blockers in heart failure: are pharmacological differences clinically important? Heart Fail Rev 9:123–130.
. (2002) Functional selectivity of dopamine receptor agonists. I. Selective activation of postsynaptic dopamine D-1 receptors linked to adenylate cyclase. J Pharmacol Exp Ther 301:1166–1178. (1997) Agonist efficacy and allosteric models of receptor action. Ann NY Acad Sci 812:98–115. (2002) A look at receptor efficacy. From the signaling network of the cell to the intramolecular motion of the receptor, in The Pharmacology of Functional, Biochemical, and Recombinant Systems Handbook of Experimental Pharmacology (Kenakin TP, Angus JA eds), vol 148, pp 217–280, Springer, Heidelberg, Germany. (2001) Single-molecule spectroscopy of the β(2) adrenergic receptor: observation of conformational substates in the membrane protein. Proc Natl Acad Sci USA 98:8469–8474. (2009) Evaluating cellular impedance assays for detection of GPCR pleiotropic signaling and functional selectivity. J Biomol Screen 14:246–255. (2007) Signaling through a G protein-coupled receptor and its corresponding G protein follows a stoichiometrically limited model. J Biol Chem 282:19203–19216. (2005) Morphine side effects in β-arrestin 2 knockout mice. J Pharmacol Exp Ther 314:1195–1201. (2005) When 7 transmembrane receptors are not G protein-coupled receptors. J Clin Invest 115:2971–2974. (2006) β-Arrestin-2 mediated inotropic effects of the angiotensin II type 1A receptor in isolated cardiac myocytes. Proc Natl Acad Sci USA 103:16284–16289.
. (2008) Nicotinic acid receptor agonists differentially activate downstream effectors. J Biol Chem 282:18028–18036.
. (2008) Multiplexed assays by high-content imaging for assessment of GPCR activity. J Biomol Screen 13:449–455. (1987) Multiple mechanisms of serotonergic signal transduction. Life Sci 41:1051–1064. (2009) Physiological and pharmacological implications of β-arrestin regulation. Pharmacol Ther 121:285–293. (2008) Agonist-directed signaling of the serotonin 2A receptor depends on β-arrestin-2 interactions in vivo. Proc Natl Acad Sci USA 105:1079–1084.
. (2010) Deconvolution of complex G protein-coupled receptor signaling in live cells using dynamic mass redistribution measurement. Nat Biotechnol 28:943–949. (2002) Subtype specific roles of β-adrenergic receptors in apoptosis of adult rat ventricular myocytes. J Mol Cell Cardiol 34:823–831. (1956) A modification of receptor theory. Br J Pharmacol Chemother 11:379–393. (2008) Location, location, location…site-specific GPCR phosphorylation offers a mechanism for cell type-specific signaling. Trends Pharmacol Sci 29:413–420. (2007) Aripirazole has functionally selective action at dopamine D2 receptor-mediated signaling pathways. Neuropsychopharmacology 32:67–77. (2004) Agonist-specific regulation of the δ-opioid receptor. Life Sci 76:599–612. (1992) The thyrotropin receptor and the regulation of thyrocyte function and growth. Endocr Rev 13:596–611. (2007) β-Arrestin-biased ligands at seven transmembrane receptors. Trends Pharmacol Sci 28:416–422. (2010) Selectively engaging β-arrestins at the AT1R reduces blood pressure and increases cardiac performance. J Pharmacol Exp Ther 335:572–579. (2006) G-protein-coupled receptor kinase specificity for β-arrestin recruitment to the β2-adrenergic receptor revealed by fluorescence resonance energy transfer. J Biol Chem 281:20577–20588. (2009) β-Arrestin1 mediates nicotinic acid-induced flushing, but not its antilipolytic effect, in mice. J Clin Invest 119:1312–1321. (1999) Clozapine and other 5-hydroxytryptamine 2A antagonists alter the subcellular distribution of 5-hydroxytryptamine 2A receptors in vitro and in vivo. Neuroscience 91:599–606. (2007) A unique mechanism of β-blocker action: carvedilol stimulates β-arrestin signaling. Proc Natl Acad Sci USA 104:16657–16662. (2007) A comparison of noninternalizing (herkinorin) and internalizing (DAMGO) μ-opioid agonists on cellular markers related to opioid tolerance and dependence. SYNAPSE 61:166–175.
. (2005) Cardiac-specific overexpression of At1 receptor mutant lacking Gαq/Gαi coupling causes hypertrophy and bradycardia in transgenic mice. J Clin Invest 115:3045–3056. (2009) Selective engagement of G protein coupled receptor kinases (GRKs) encodes distinct functions of biased ligands. Proc Natl Acad Sci USA 106:9649–9654.